I have an issue with textures. Not sure if I'm doing something wrong. I have this image showing 3x2 roof tiles. The tiles are 35 cm high and 26 cm wide. So the image is 78x70 cm in real life. See first two images. 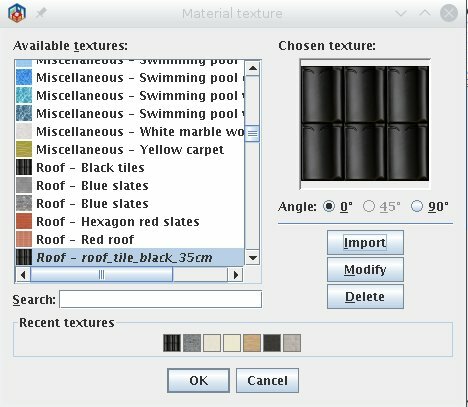 I select a roof object and in image 3 and 4 change materials to this rooftile texture. The object is 2m wide, 5.25m deep and 3.925m high, making the. 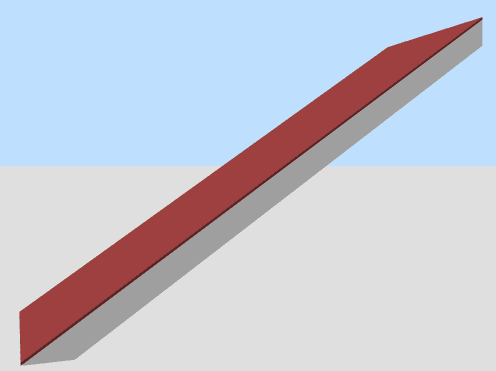 sloped surface around 6.57 meters long (sqrt(5.25^2+3.925^2)). and vertically 657/35 = 19 rooftiles. However image 5 shows 12x25 tiles. In image 6 I make the roof 2 times the width and would expect to see more tiles. Instead it seems the tiles are scaled to still show 12x25 tiles. Changing the general texture instead of materials gives a different behaviour. Image 7 shows 8x25 tiles. So horizontally it is ok but vertically it is not. horizontally. So in this case the tiles are not scaled. hi mirakels, sorry i cannot help you on sorting this issue, but if you do suss it out i would love to know how, roof textures are a pain and can ruin a design. Did you create this roof yourself? 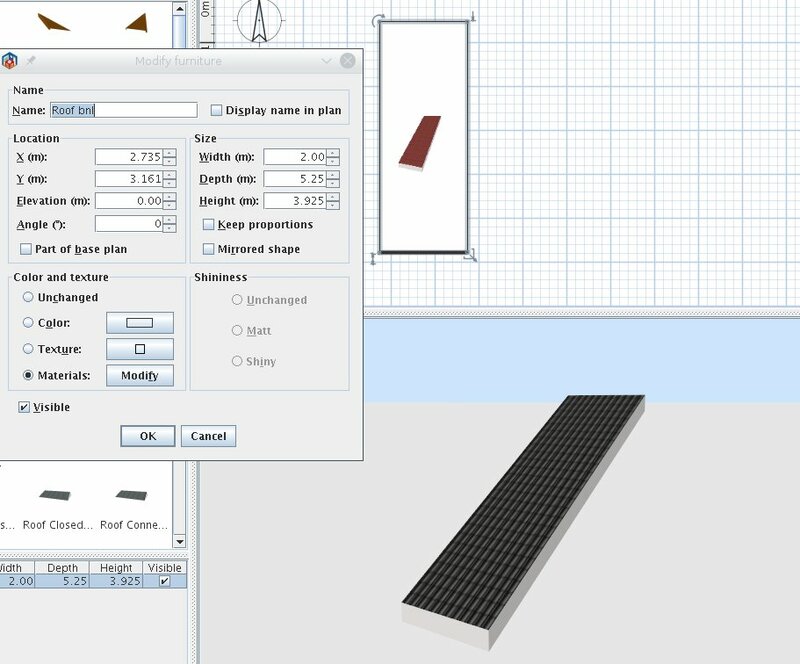 You should apply final texture(its size determines number of texture tiles) before you export your model. 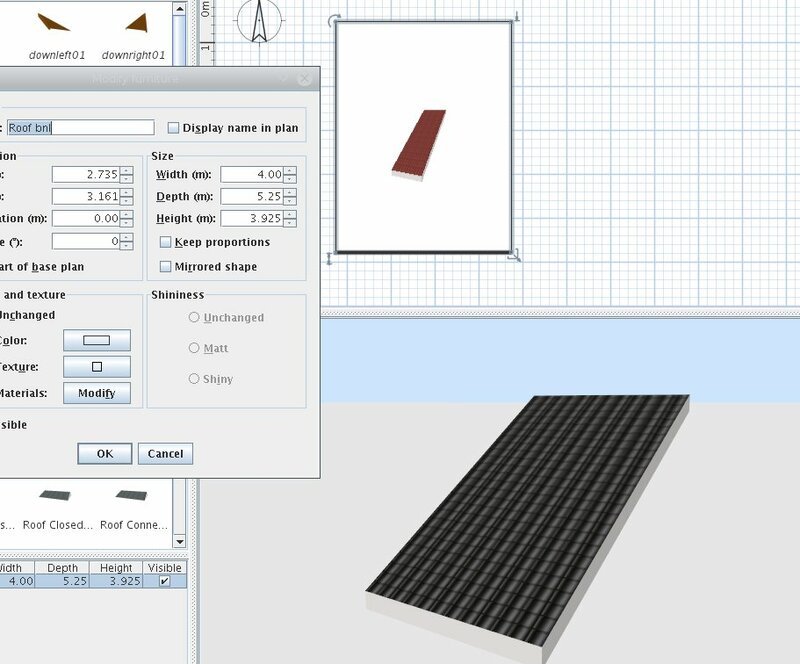 "Materials" option doesn't change original mapping (including number of tiles), new texture image replaces original one but takes its properties, such as tile size and proportions (square image is stretched and/or squeezed if original tile is rectangular etc.). 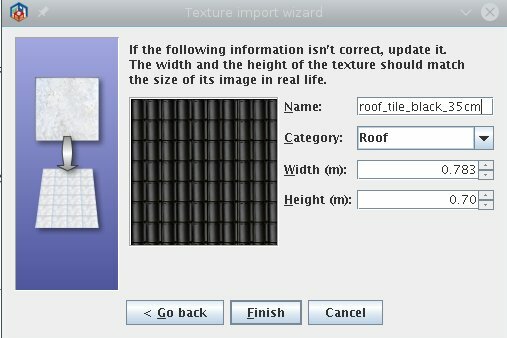 "Textures" option ignores original mapping(number of tiles depends on new texture size and model size), but applies texture to each part of model. Texture might be distorted if "face" is not parallel to front or top side of bounding box - I think that's why you have too many tiles vertically. Hi Alex, yes, It could be that the material textures are handled in this way, and that this normally is the proper way to do it. On the other hand I can imagine shapes that are resized for which you don't want the textures to be resized along with it. For instance I used the box object and resized it to make it occupy a specific area as a raised floor. Then I applied a texture on the top of the box and it looked awfull because the textures was completely blown up. 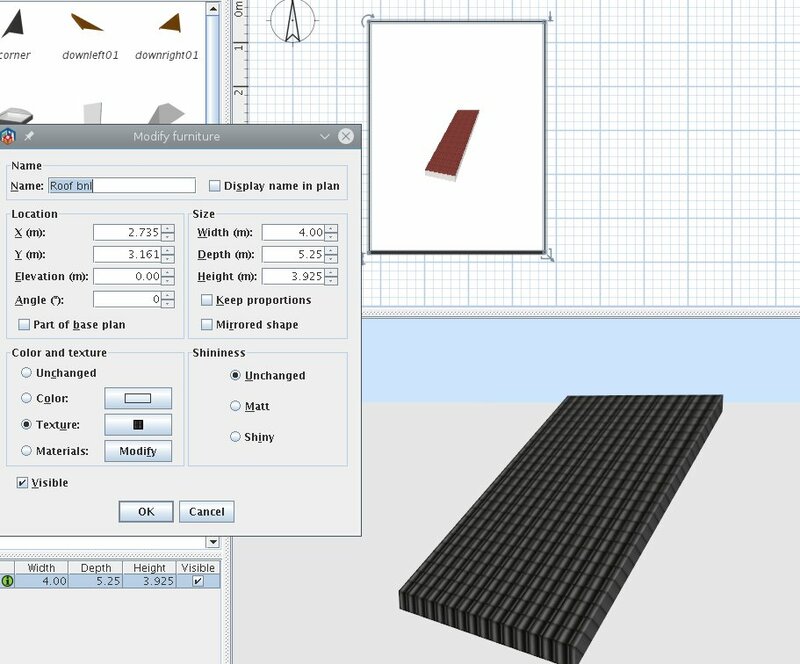 I think an extra option to each object material may be useful to allow it to resize the texture or not with resizing the object, but just replicate the pattern. Oh, The roof elements are from the "Roof BNL" set made by Ola-kristian Hoff. Ah yes, it did look familiar. Now, it has been a while, and I cannot find the original model. 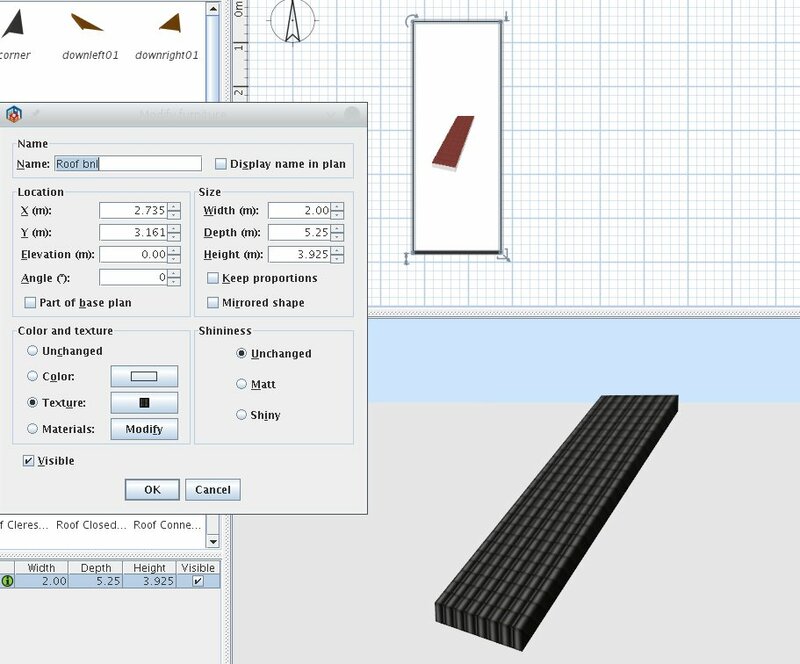 It was for a specific house using several roof models next to each other (grouped) instead of stretching the roof. 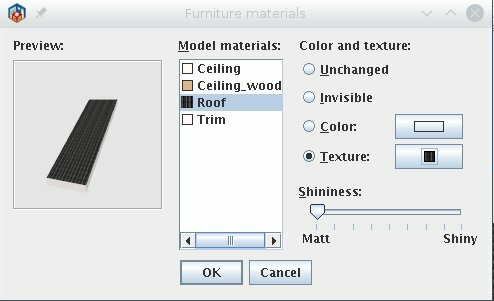 So if I remember correctly, issue comes from the way the textures are defined for the roof surface in the model, there is a set number of texture tiles and they will stretch with model. I think, the original was intended for the roof (at original size) to use a texture 60×60. The advantage of the tiles being locked that way is that the texture will align with surface edges so you do not end up with half tiles. Maybe I miss something in what you wrote, but did you try changing the texture you use? 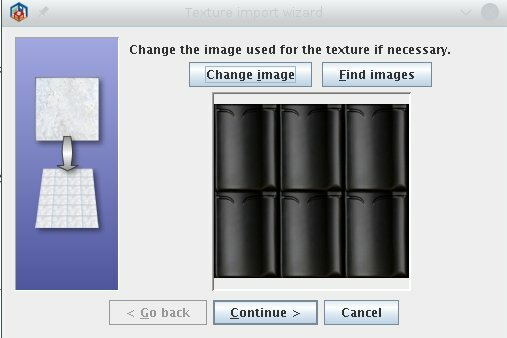 If you tile the texture (with the GIMP or some other editing software), you should get more tiles on the same surface. PS - yes, there is a difference in how SH3D treats textures depending on whether a texture is applied to the model as such, or to defined surfaces. Thanks okh, will have a look at it later on. PS: what tool do you use to create these models? Not sure. The roof modules were hastily designed and kept simple for a very specific building. Simple elements that do not have too much geometry to interfere when combining sections. That, of course, means a couple of compromises - and lack of elegance and detail. PS Basic geometry like this can be made with pretty much any tool - including the Generate 3D shape plugin (see thread 6600) - or even by drawing walls in SH3D, exporting as .obj and import/rotate. This thread may be of some help to you in creating a roof. There's also this tutorial by Hans Dirkse.